The liberation of Southern Africa and the dismantling of the Apartheid regime was one of the major political developments of the 20th century, with far-reaching consequences for people throughout Africa and around the globe. Struggles for Freedom: Southern Africa focuses on the complex and varied liberation struggles in the region, with an emphasis on Botswana, Mozambique, Namibia, South Africa, and Zimbabwe. Struggles for Freedom: Southern Africa brings together materials from various archives and libraries throughout the world documenting colonial rule, dispersion of exiles, international intervention, and the worldwide networks that supported successive generations of resistance within the region. The resource consists of 76 different collections of more than 20,000 objects and 190,000 pages of documents and images, including periodicals, nationalist publications, records of colonial government commissions, local newspaper reports, personal papers, correspondence, UN documents, out-of-print and other particularly relevant books, pamphlets, speeches, and interviews with those who participated in the struggles. The materials in Struggles for Freedom: South Africa were selected with the guidance of national advisory committees consisting of leading scholars, archivists, and public intellectuals in six African countries along with scholars from outside the region. Please contact Adam Clemons at aclemons@berkeley.edu with your feedback about this resource. OskiCat will be down on Tuesday, September 26, 2017, at 7 am. OskiCat will be back by 8 am. OskiCat will be down for maintenance on Tuesday, September 12 from 7 – 8am. 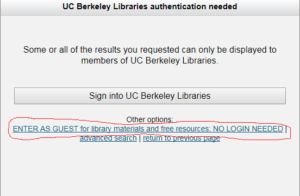 Melvyl is currently asking users who are connected to the campus network to log in to view resources. The California Digital Library (CDL) is working to resolve the problem. Until the problem is resolved, please click on the ENTER AS GUEST link near the bottom of the login screen. All OCLC services will be unavailable sometime between 9:00 PM on Saturday, September 9 to 3:00 AM (PDT) on Sunday, September 10, 2017. Affected Services include Melvyl, FirstSearch, and WorldCat.org. Start your Search on the Library Web home page, and OskiCat will be available. All OCLC services will be unavailable some time between 8:00 PM on Saturday, August 5 to 5:00 AM (PDT) on Sunday, August 6, 2017. Start your Search on the Library Web homepage, and OskiCat will be available. University of Chicago Press has currently blocked the Proxy IP from accessing content on www.journals.uchicago.edu due to a suspected breach; we are working with University of Chicago Press to resolve this as quickly as possible. University of Chicago Press content should still be accessible on-campus. Apologies for any inconvenience this may be causing. Numerous library resources have been impacted by the ongoing Amazon Web Services outages. The AWS outage has affected access and functionality across numerous platforms, including JSTOR, Elsevier ScienceDirect, and Proquest, among others. Library users may experience issues accessing web pages or downloading content from impacted resources while Amazon works to fix the issue. UPDATE: The AWS issue seems to be resolved, and normal access and functionality has been restored to affected resources. We have been experiencing intermittent access issues via the proxy at CRCnetBASE due to an indexing issue. We are working with them to resolve the issue as quickly as possible, and will update when we have more information. Sorry for any inconvenience this may be causing. UPDATE: Proxy access has been restored.